Innovation is a prolific and fascinating topic, reams have been written about the different types of innovation and how to create the most favorable conditions to cultivate it, and yet it remains elusive to many, especially in the enterprise. 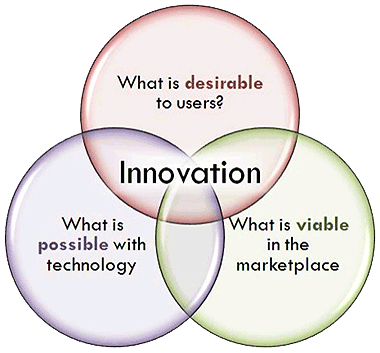 The below Venn diagram is a classic one that has been used to illustrate the intersection of innovative business strategy — what is viable in the marketplace, design — what is desirable to people and engineering feasibility — what is possible with technology. The diagram suggests that these three elements must come together to create successful innovation, but not how that convergence should happen. In this rapidly evolving era of digital transformation and consumerization, there is a strong recognition across all industries that human-centered design must be front and center in a successful business strategy. Business leaders and product managers have a private days-long huddle where they talk about strategy, market segments, share and potential, competitive research and threats, business opportunities, client needs and more, and then come down the mountain and share a grand vision of a product roadmap with designers and engineers. Designers are then expected to turn that vision into wireframes as soon as possible, as the engineers are raring to go. The vision has not yet been filtered down into validated, detailed requirements and user stories yet, and now the UX team is the bottleneck. The UX researchers and designers want to ensure that they design the right product functionality with a high level of confidence that the end result will resonate with the target audience, but accomplishing that will take research and design cycles and the team needs to get down to brass tacks quickly. Compromises happen. The designers start working on “best guess” wireframes so that they can feed the beast. I call these “best guess”wireframes because while a designer’s instinct as to the optimal information architecture, layout and task flow is likely better than the layman’s, in this scenario the design is not based on deep knowledge of customers’ emotions, attitudes, aptitudes and behaviors, and is therefore a blind, best guess. Concurrently, we make a good faith effort to start down the path of some exploratory research to really understand the jobs to be done from the consumer standpoint. At this point, given that we’ve already started a product implementation, we will almost certainly be perpetually behind the curve, biased in favor of the work that has already commenced, and less than likely to integrate findings from discovery research despite our best intentions. We simply plow ahead and hope that the linear process we followed taking business vision and intent, adding in design thinking and then engineering know-how will result in the innovation we aspire to. Hope is not a business strategy, and innovation is not a linear process. So what is the alternative to the above painful scenario? The winning formula is a partnership of equals with representatives from Product Management, UX and Engineering collaborating closely on a product, solution or service from inception through delivery to market, and then throughout a sense and respond feedback loop with consumers. This partnership is commonly referred to as a 3-legged stool approach, because of the stability and balance that each leg, or discipline, brings to the product vision and strategy. The legs are not added in as the product development process progresses, but are firmly fixed in place from the get-go. Shared team ownership of the user experience reflects a deeply held agreement that everyone on the team needs to understand and be able to articulate who the product’s target audience is, their emotions and attitudes towards their work, the challenges they face every day and what progress they are trying to achieve when using our product. At Pitney Bowes, we have create a Design Thinking maturity matrix which describes how well best practices for UX research and design are integrated with the product development process, and we have consistently found that as teams advance to higher levels of design thinking maturity the cross-functional team is actively participating in user-centric activities like user research sessions and design studios, and is leveraging design artifacts like user personas to frame product functionality conversations. 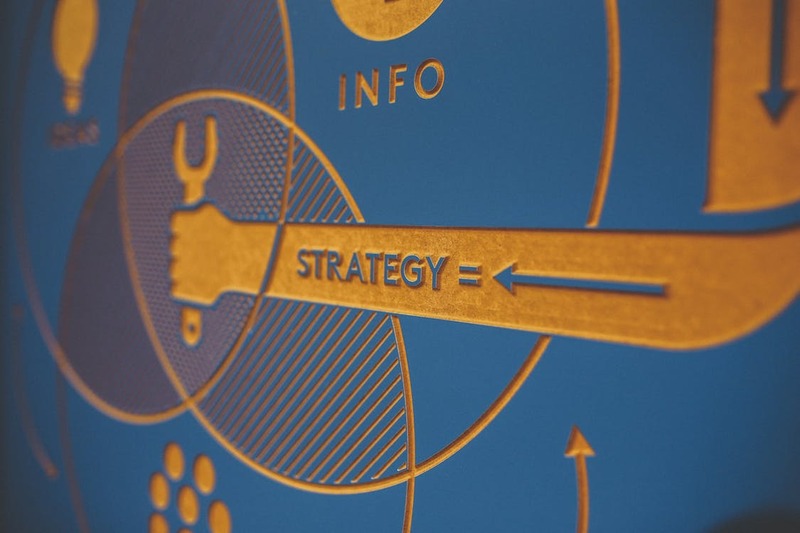 With a firmly established foundation of user-centricity, the team works to get and stay aligned on the problems worth solving for the users within that target audience and finding the approach that will solve those problems elegantly and effectively. 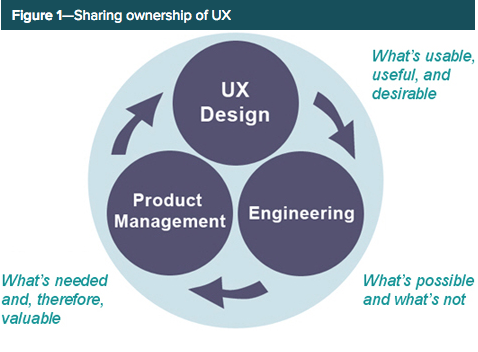 The role of UX strategy has been described as “not building a usable, wrong thing”, which describes the potential for a fully usable product to not resonate with the target audience if the team didn’t conceive of their product strategy while considering the intended end users and their jobs to be done. At Pitney Bowes, we have found the hardest leap for a product team to take in their Design Thinking maturity is from Practitioner to Expert level. At the Practitioner level, design practices like prototyping and wire-framing are in place, but learning from clients is not established at a regular cadence and may not have active participation from all team members when it does happen. A cadence of concept prototyping and research activities is established with active team participation. Insights and recommendations drive a validated backlog with high priority. Exactly how this is implemented process-wise will vary from team to team, and there will likely be a need for some trial and error to find the model that works for each team. A key component of this is nurturing a culture of agility and a fail fast mentality where teams know that product iterations will be ongoing and they don’t have to get everything right up front and spend a lot of time doing it.The outcome we are driving towards is the creation of a design-infused culture, where there is recognition, commitment and partnership to drive these activities from the highest levels of the organization and that teams are empowered to be generative and experiment so that they learn how to build the right product the right way. What roles do you think design play in business strategy? We'd totally love to hear from you on @XiMnetMY.